STRIPER SOUP :: View topic - 2010 FYAOSBO!!!! Posted: Tue Nov 02, 2010 12:07 am Post subject: 2010 FYAOSBO!!!! Can we start trash talking since its only a month away? Come on Dirk, I know you have been thinking about it. Whats up Mike Mad, Tim A, Eric my knee hurts Engebretsen? Ezell your mayor race is over after this week. Shawn, no excuses because you live in Georgia. Who is going to be the champ? We have some new guys that should have a good showing. It's time. Same general format as last year. 3 size classes (0-15, 15-30, and 30+), longest fish takes all. Results will not be shown until the end of the FISH OFF this time to prevent "premature defeat." Only trash talking and speculation will be allowed, no size sharing! I don't know what I'm going to do for catching fish this year. Funds are low and the wife has already told me I've been to TN too many times. I am officially a work-a-holic now.... which leaves little time for fishing, but is wayyyyyyyy better than being unemployed. Regardless of that though, I will regain the Big Fish title from medium sized fish Jerry , and renew my current title as the 30+ lber champ.AND I will do it in Georgia within an hour of my house. SOME OF US DON'T NEED TO RUN TO ANOTHER STATE TO CATCH A BIG FISH, and luckily for me I am one of those that doesn't. You boys not willing or good enough to catch big fish in your home waters, go ahead and run to Tennessee and catch your 20-30 lbers. It will take a 40+ to beat the "Mighty One". It wouldn't be the fish off without you Dirk. Two of these competitions have been won, well, GEORGIA STYLE!!! The stats have spoken!!! SML boys might be the ones to beat this year. Those guys sure do fish a lot. Yeah, we (SML) can take care of the 0-15lb class no problem. We got lots of skinny 15lbers. We got no shot at the 30lb+ category without a miracle. We saw some 30lbers this spring but they were stuffed with eggs. Hokiechad's 24 is the biggest I've heard of so far this fall. You never know though, I bet we got a couple 40s somewhere in the lake. Do saltwater stripes count? I'm planning on going to the bay for some 50lbers! Ok - I found the CATEGORY with the rules and info from previous years - did not even have to search - just open my eyes. Sounds like fun and a little motivation to find time in the busy month of December to get out there! EarlyRiser - I so look forward to when SML could again be a strong contender for the upper end of the middle-weight class (we're getting there)- or even the heavy-weight class - we can dream - no? Salty striper ARE allowed...at least for now! Nobody has turned one in yet, so we'll see how that goes. Count me in in all categories. 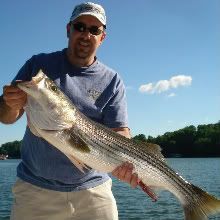 Raystown has been producing well in all of the above sizes. Hopefully I can make a strong standing way up here in PA. Is there still an unlimited class? if so when your money is sent in are you automatically entered into the unlimited class? Shawn is your phone number the same as it was in the 2008 rules post for fish reporting? Also Is the Soup dues address where we are to sent our registration fee? Sorry about the many questions but November and December is so busy with fishing, hunting and holliday stuff, If I dont send it soon I will never get around to it. I have everybody's email in a list who is a dues-paid member. I'll send a mass email with some things like the FYAOSBO and 2011 dues info pretty soon. It's about to re-register with the Soup!